Welcome to SlingGrip Custom Phone Grips! Custom phone grips are the hottest category in promotional products and the American-made SlingGrip® smartphone grip is sure to please your clients in any category. This fun, useful and naturally viral branding tool is sure to start conversations everywhere it goes. ​SlingGrip® is an American-made universal patented smartphone grip that sticks flat to the back of your phone, tablet or case with its 3M® no-residue adhesive. Once attached, the SlingGrip® is ready to use as a comfortable grip for selfies, texting and so much more. ​SlingGrip® improves functionality of smartphone use and provides security, preventing drops and damages. ​The custom patented phone grips feature original 3M® no-residue adhesive to ensure an ultra-strong bond to cases and phones. 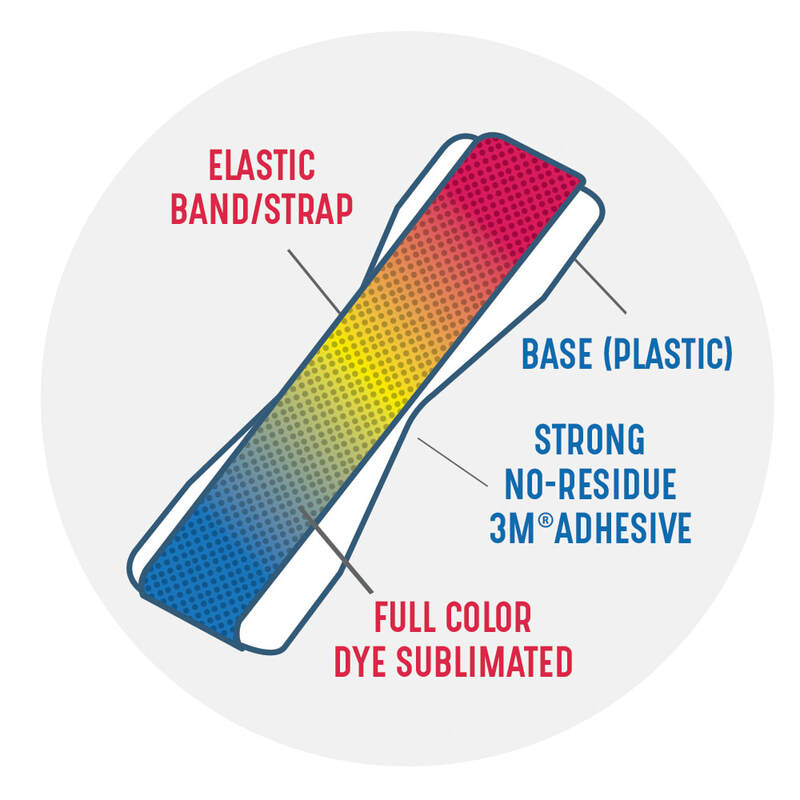 The proprietary elastic blend is custom made in New Jersey for maximum comfort, strength, and ensures the best quality FULL-COLOR print. The plastic bases are made in TEXAS with high quality ABS and are available in a variety of colors. SlingGrip® delivers on customizable FULL-COLOR marketing cards to offer extended messaging space for your client. mini-brochure for your client , with instructions for the end user. 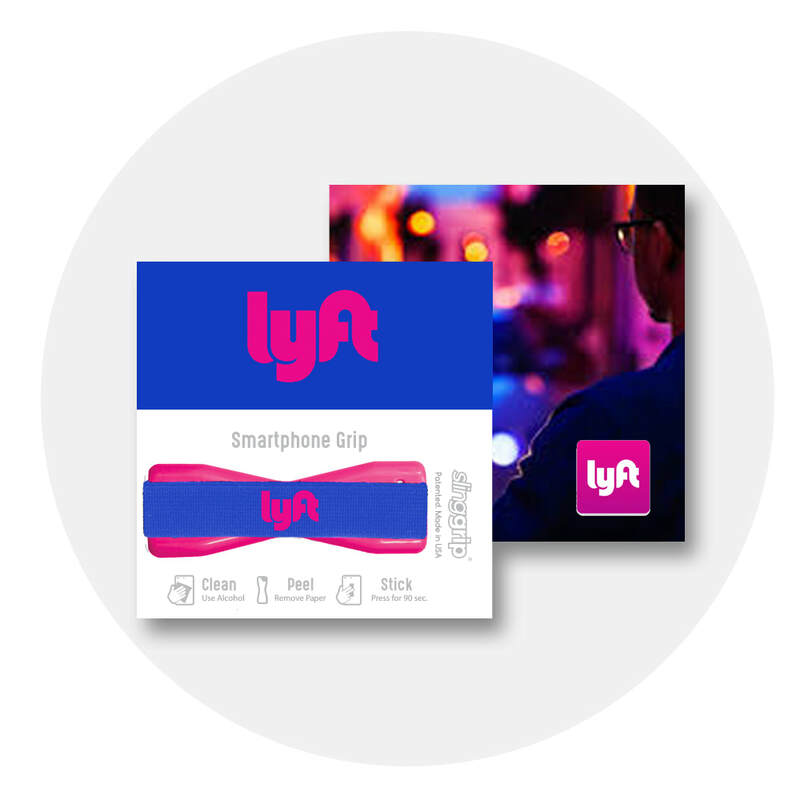 ​Make your client's day by offering them a full color marketing card plus a full color SlingGrip® phone grip for under $3(c). Visit our Distributor Tools section for Virtual, Sample, Spec & quote requests for brochure & template downloads and other tools. Check out the short video above to see why SlingGrip® is a different kind of promotional products supplier. ​Full color custom printing ensures your clients will get the POP they want from their promotional products without breaking the bank. SlingGrip® is great for trade show swag, branding give-aways, fundraisers, recruitment and so much more. 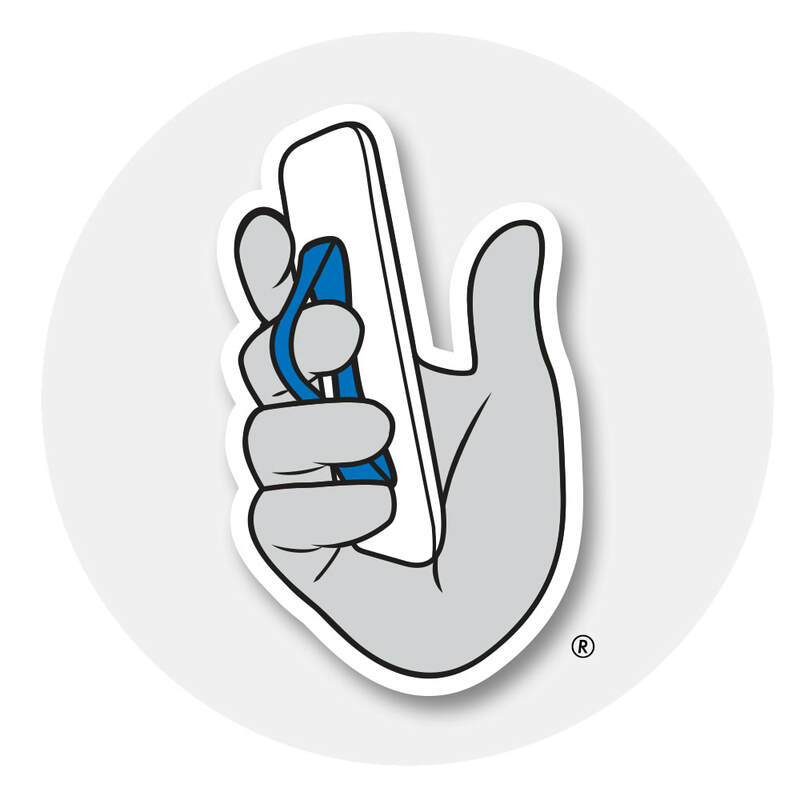 ​Smartphones are the most visible item in modern life and the universal SlingGrip® is destined to become a conversation piece and won't end up in a drawer or the trashcan like so many promotional products. Get your client's brand in the conversation! Highly functional and fully customizable smartphone handles will be a hit with your clients. DMD Products is the ONLY supplier and manufacturer of the PATENTED SlingGrip® Smartphone Grip. The SlingGrip is a highly functional AMERICAN-MADE patented product that bridges the gap between the beloved smartphone and your customer's hand. Full color dye-sub print and mounted card, which can be customized. © Copyright, 2014-2017 DMD Products, LLC. All rights reserved. SLINGGRIP and related designs are trademarks of DMD Products, LLC. Other trademarks are owned by their respective owners. US Patent #9,259,077 and #D735,695S - Additional U.S. and Foreign Patents Pending.